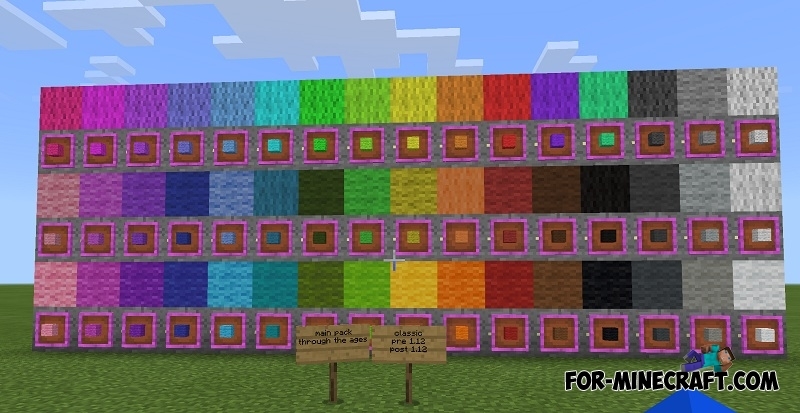 This texture pack expands the standard set of colors for wool blocks which means more colorful structures. Fans of building in Minecraft simply adore packs or addons that add more opportunities to the main function of the game - to create creative and unusual structures. This pack contains 112 new colors that can be an excellent basis for any creation. Also, you can install additional textures to smooth out the unevenness and remove excess detail from the surface of the blocks. Using the whole set of colors you will open new boundaries that are especially important in mini games such as droppers. Some colors are difficult to distinguish, but they are really different because of the shades. How to install New 112 Wool Colors?